Lucky for us all Arugula aka rocket is not only one of the most delicious greens to grow but amongst the easiest too. To prepare your planting area, enrich the soil with compost, roughly digging a generous amount into each spot where you intend to plant, water in well. We here at EcoWise Planters like to grow a continuous supply, to achieve this after planting our initial seed we then plant more seed after two weeks, and so on until the end of the season. Sow your seeds in twos, spaced 5-10cm apart and cover with a sprinkling of soil. Water the seeds in from the top of your planter using a watering can; continue to water from above until seedling reach harvesting height. If hot weather is turning the leaves bitter and making your Arugula plant push up flowers, don’t despair the flowers are edible and will attract beneficial insects to your patch. Arugula is a fuss free plant with little fertilising requirements; we feed a liquid fertiliser only if the leaves are yellowing. Arugula like many others is a cut-and-come again plant that will keep you in good supply until the plant sets flowers. Start harvesting when the seedlings are 8-12cm long, the younger the leaves the better they will taste. Be sure to pick from the outside of the plant working your way inwards with each harvest. Frequent harvesting encourages new growth. Allowing some of your plants to go to seed sometimes results in a self-sown crop. 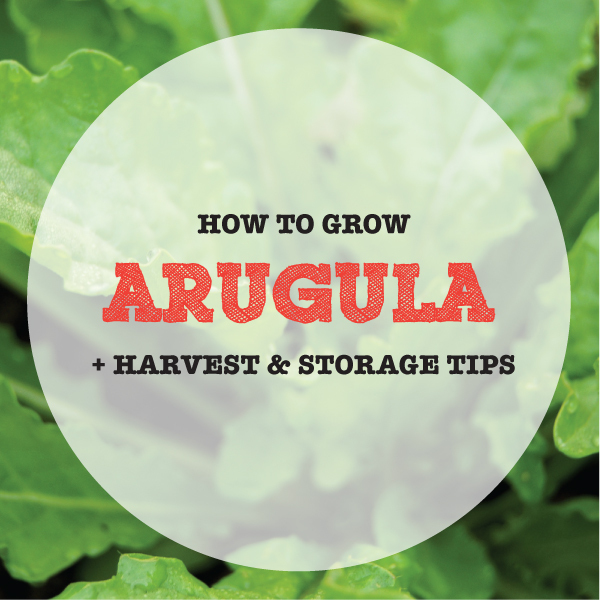 Arugula is best picked and eaten fresh, however if stored correctly it may last in the fridge for a few days. To refrigerate, wash the leaves in cool water, dry them on absorbent paper towel and then store them in a large zip lock bag. Lining the bag with absorbent paper towel will wick away moisture keeping the leaves fresher for longer.